True to the spirit of travel, sharing meals is the best way to exchange stories, travel tips, and adventures from the day. 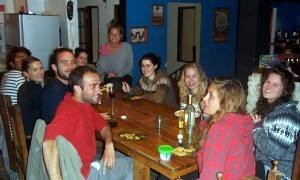 Here is a group of travelers eating a delicious meal they prepared while staying in Cafayate, Argentina. The meal might be cheap, but the experiences created over it are priceless.